Movie Ramble: Dr Strangelove or How I Learned To Love The Bomb. Dr Strangelove or How I Learned To Love The Bomb. 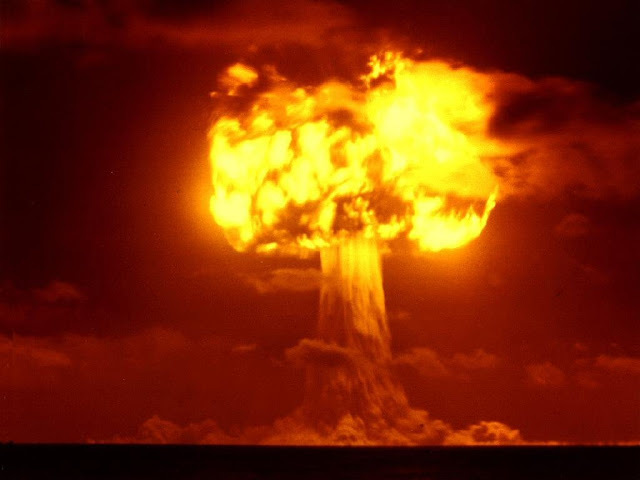 The threat of the Cold War. I know I’ve probable brought this up before, but it’s quite odd how you can get through life without seeing certain very famous movies, Dr Strangelove (1964) is another case in point. The films basic premise is very well known in that a US General Jack D Ripper (Sterling Hayden) who while holding RAF officer Lionel Mandrake (Peter Sellers) captive, launches a nuclear attack on the USSR leaving the President of the United States Merkin Muffley (Sellers) with his hands full attempting to recall the B-52’s and calming his Russian opposite number. All this while contending with his madcap advisers and a twisted ex-Nazi scientist, the Dr Strangelove (that man Sellers again) of the title. 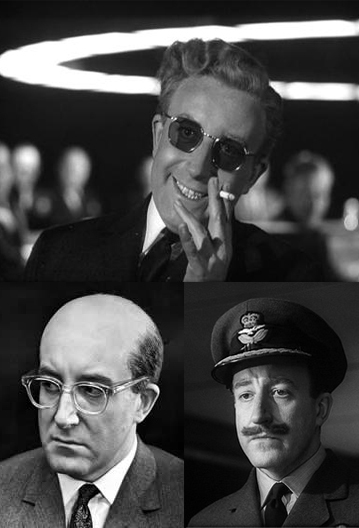 Peter Sellers to the power of three! Based on a serious novel by Peter George called Red Alert, which deals with an impending holocaust caused by inflexible military and political policy, Dr Strangelove is much more of a political satire than a comedy. Stanley Kubrick’s film brings the best out in both Sellers and George C Scott as General Buck Turgidson, who after this role swore he would never work for the director again. To be truthful I don’t think the films dated particularly well, it does seem a little tedious maybe because, thank the Lord, unlike the period when the film was made, just before the Kennedy assassination (which delayed the films release), the concept of Cold War tension is no longer with us (although we do has plenty of other things to worry about, including the isolationist politics recently preached by our gallant leader!!) The movie earned Kubrick three Oscar nominations, for writing, directing and producing but as a political satire I think my favorite Kubrick movie A Clockwork Orange (1971) holds up much better.